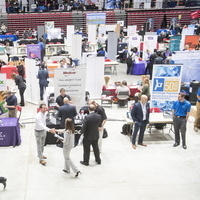 It was well organized and as a student it was a nice experience to get to go out and speak with professionals that might be possibly in the same careers that we want to pursue or that the y can help us get to those positions. The only thing that me an other students whished for was for there to be more big companies. We felt that it was limited in business that where local or that there wasn't enough options. The idea that most of us students have is to finish school and head out to bigger opportunities like Amazon ,Adidas ,Nike , more well known companies or companies that are starting off and want to achieve in becoming a big company. There were companies I didn't see before; more of, companies that works behind the scenes - Payroll - of major companies. One company messaged me through LinkedIn before I could do some research on the companies attending the fair. Today, I received an email about setting up a phone with 1 of the 4 companies I talked to. I love the Internship fair; plus, there's free stuff! New experience, talking to different companies has given vast variety and diverse knowledge.